One in eight Americans and one in seven Arizonans struggle with hunger. 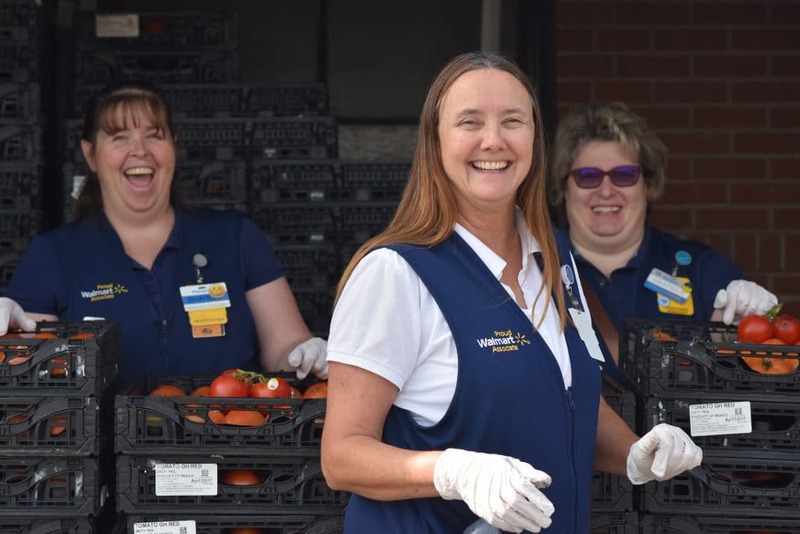 To raise awareness and combat the issue, Walmart, Sam’s Club, Feeding America® and St. Mary’s Food Bank are kicking off its sixth annual nationwide “Fight Hunger. Spark Change.” (FHSC) campaign, which will run from April 22 to May 20. Last year, the FHSC Campaign resulted in a donation of 1.67 million meals to St. Mary’s, helping the food bank pay for important client programs including the Mobile Pantry Program, which drops food into more than 40 of the more impoverished areas of the state, giving surrounding residents access to more supplemental food for their families. Walmart volunteers will team with St. Mary’s and neighborhood volunteers to distribute Mobile Pantry food to clients on Thursday, April 25 at the Pilgrim Rest Baptist Church (1401 East Jefferson Street in Phoenix) from 9-11 a.m.
More than 200 families receive food from this mobile pantry site twice a month and represents how “Fight Hunger, Spark Change” impacts the hungry all over the country. Walmart and Sam’s Club now invite Arizona shoppers to help fight hunger in their local community. There are three ways to participate – purchasing a participating item in-store or online, donating in-store or donating on Feeding America’s website. With 749 million meals achieved over the last five years, Arizona customers and members can help the Feeding America network secure its 1 billion cumulative meals goal in three ways. They can track the number of meals by visiting www.walmart.com/fighthunger. For every participating product purchased at U.S. Walmart stores, Sam’s Clubs or on Walmart.com during the campaign, the supplier will donate the monetary equivalent of at least one meal ($0.10) on behalf of a Feeding America member food bank, up to applicable limits. Donate money to your local Feeding America food bank at participating Sam’s Club and Walmart stores in the U.S.
Walmart kick-started the campaign with a $3 million donation to Feeding America and member food banks including St. Mary’s A purchase of one of the 267 participating items helps secure the equivalent of one meal. Each Walmart and Sam’s Club will partner with at least one Feeding America local food bank, and the 18 participating suppliers include: Bush Brothers, Campbell’s, Conagra Brands, Cliff Bar, General Mills, Gold Peak Tea, Great Value, Hidden Valley, JM Smucker, Kellogg, Kraft Heinz, McCormick, Motts, PepsiCo, Post, Uncle Ben’s, Nature Nate’s Honey and Unilever. To learn more about the campaign visit www.walmart.com/fighthunger. Benefits St. Mary’s Food Bank, & Many Other Food Banks around the State. 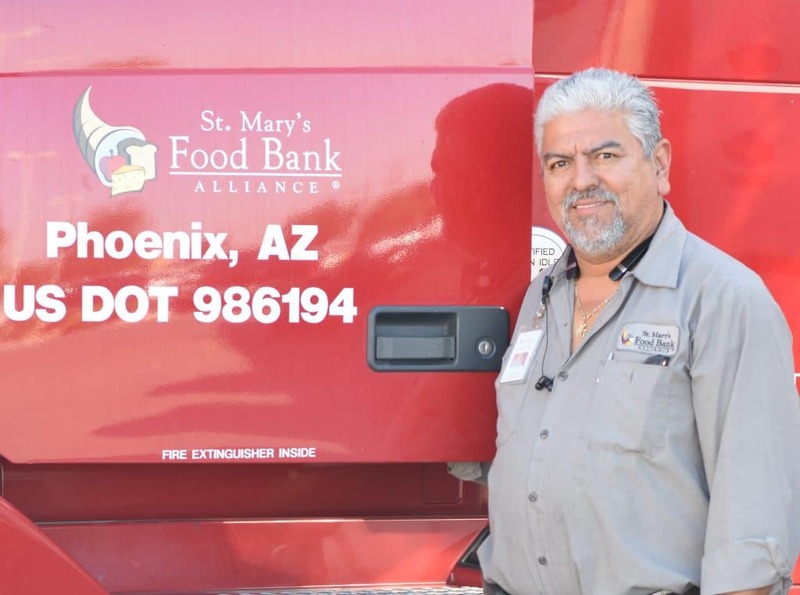 The largest single-day food drive in the United States – one which helps St. Mary’s Food Bank and other Arizona Food Banks stocked during the long, hot summer – turns 27 years old in 2019. And it all takes place at your mailbox. On Saturday, May 11th, over 230,000 letter carriers nationwide, including over 5,000 here in Arizona will be picking up canned food donations on their regular mail routes during the National Association of Letter Carriers (NALC) “Stamp out Hunger” Food Drive. This drive began right here in Arizona more than 40 years ago. In 1976, Phoenix land Glendale letter carriers from NALC Branch 576 began picking up food donations in their own pickup trucks for St. Mary’s Food Bank. That soon evolved into a national effort that has collected more than a 1.5 billion pounds over the last 24 years for Americans suffering from food insecurity. More than 70 million pounds nationwide was collected in 2018. Throughout the week leading up to the food drive, local letter carriers will be dropping off reminder post cards and special grocery bags to both city and rural residents’ mailboxes. The letter carriers encourage those who can help to fill the bags, or any other grocery bag, with nonperishable food items and leave them by their mailboxes on the morning of Saturday May 11th. Your letter carrier will do the rest, making sure the food gets to the one in five Arizonans – and one in four children – dealing with hunger issues in our state. The hot summer months are almost here in Arizona. Food demand increases with children out of school, while donations dwindle with many residents escaping to cooler climates. With 24 percent of Arizona children living in poverty, and tough economic times challenging the community further, Arizona Food Banks rely on “Stamp Out Hunger” to provide that much-needed influx of food. St. Mary’s distributes more than 40,000 emergency food boxes each month, as well as stocking the 600-plus agency partners it serves. Items most needed by the food banks include canned fruit and vegetables, soups and meals in a can, pasta, peanut butter, tuna, rice and cereal. For more information on this event, visit www.helpstampouthunger.com. The cold Arizona winter has led to a shorter and less abundant growing season in Southern Arizona, severely impacting donations made to St. Mary’s Food Bank in February and now March of 2019. In some cases the donations are down by as much as 50 percent. That equates to nearly TWO MILLION pounds of fresh fruits and vegetables. St. Mary’s relies on these donations to provide our clients and partners with a well-balanced and nutritious balance of healthy foods. The food bank has been forced to purchase some of the foods that are normally donated in abundance this time of year to keep up with demand. St. Mary’s is asking the public to please help the Food Bank through this challenging time in one of two ways. Donations of canned fruits and vegetables would be greatly appreciated. You can donate at the Food Bank locations in Phoenix 2831 N. 31st Avenue), Surprise (13050 West Elm Street) or at any Goodwill location – there are food donation boxes at the front of each store. If folks are still looking for a place to donate the oranges they still have on backyard trees, the Food Bank would gladly accept those donations at the Phoenix and Surprise locations. We have received a LOT of grapefruit in the past few weeks – so we are specifically looking for oranges at this time. Presented in recognition for his selfless acts on October 2, 2018 when he saved the life of a trapped and badly injured driver in a vehicle accident. Mr. Carillo’s action during this tragic event demonstrates character and integrity. On that October morning, Mr. Carillo demonstrated a truly fearless act. A vehicle attempted to maneuver an illegal pass of another vehicle in a no-passing zone. The vehicle collided head-on with Mr. Carillo’s tractor-trailer resulting in heavy damage to the passenger vehicle and reckless driver. Mr. Carillo immediately determined the injured driver was pinned inside and the vehicle’s engine was on fire. Mr Carillo moved the tractor-trailer off the vehicle, retrieved his fire extinguisher and successfully put the fire out before emergency and fire personnel arrived. Often members of the public step up to assist others with no regard to their own safety and deserve recognition. Yavapai County Sheriff’s Office is extremely proud to extend this formal Award in recognition of Hectors selfless acts in Yavapai County. PHOENIX – As the government shutdown enters its third week, federal workers and their families subject to furloughs and working without pay have started to feel the effects at home. St. Mary’s Food Bank has seen a sharp uptick in the number of families reaching out for help and is stepping up its response by bringing food directly to the affected communities. Transportation Security Administration (TSA) employees are currently working their normal shifts without pay. To help the TSA families feeling the financial pinch, St. Mary’s will hold a special Mobile Pantry Distribution at the TSA Offices at Gateway Tower (410 North 44th Street, just north of Van Buren Street). St. Mary’s will be providing a balanced and nutritious array of foods for TSA workers to take home. With the partial Federal Government Shutdown now entering a third week and Arizona families missing paychecks as a result, St. Mary’s Food Bank is here to provide help to those who suddenly find themselves in in need of emergency food. For those who have never been to the food bank and are unsure of the process, it Is a simple one. St. Mary’s has more than 500 agency partner locations in the state and one is likely in your neighborhood. You can visit our main locations in Phoenix (3131 West Thomas Road) or Surprise (13050 West Elm Street) for immediate food assistance and information on the closest agency partner near your home to receive food. You can also call St. Mary’s Food Bank at (602) 242-FOOD or visit our website at stmarysfoodbank.org for more information on receiving food during this difficult time. This week, St. Mary’s sent 150 emergency food boxes and other assorted staple food items to the Grand Canyon to assist families who work at the park and have been furloughed during the shutdown. With Thanksgiving now just 17 days away, St. Mary’s Food Bank is more than 7,500 turkeys shy of its goal for its 25th annual Holiday Food Distribution that serves more than 11,000 families. Of particular concern is that total is more than 1,000 turkeys behind the pace of last year, when the food bank was able to meet its goal a few days before the distribution. St. Mary’s is accepting donations at its locations in Phoenix (2831 N. 31st Avenue) and Surprise (13050 West Elm Street) Monday through Friday from 8 am to 4 pm and volunteers will be at 30 Albertsons and Safeway locations for the annual Super Saturday Turkey Drive on Saturday, November 17 to collect your donations of food and funds. The 100-degree temperatures are finally in Arizona’s rear-view mirror. This means it’s almost Turkey Time – and St. Mary’s Food Bank Alliance’s Super Saturday is just around the corner! St. Mary’s will hold its 12th annual Super Saturday Turkey Drive, presented by Mobile Mini, on Saturday, Nov. 17 from 8 a.m. to 2 p.m. at Food Bank locations in Phoenix and Surprise as well as 28 Albertsons and Safeway locations around the Valley striving to meet the anticipated need for the 2018 holiday season. The Food Bank distributed more than 11,000 Holiday Food Boxes in the three days leading up to Thanksgiving in 2017. Each year, hopes are that each will contain a turkey and other assorted holiday dinner items giving Arizona families the chance to enjoy the comforting tradition of a holiday meal. In addition to helping reach the goal of 7,000 donated turkeys, St. Mary’s Food Bank staff and scores of volunteers will gladly accept any monetary or food donations (both perishable and non-perishable) on Super Saturday. All donors are invited to register for a chance to win 50,000 AAdvantage miles for Travel donated by American Airlines. Today, you can help feed a hungry neighbor. Right here in our area we distribute enough food for 250,000 meals every day to people at risk of going hungry. We believe that everyone should have access to food. That is why September Hunger Action Month is so important – 30 days of focusing on ending hunger and increasing awareness that there is still a lot to be done. For example, the steeply rising cost of food, rent and basic necessities is making it extremely difficult for low-income families, seniors and others in need. Our neighbors are suffering. There are seniors who have worked hard all their lives, yet they are skipping meals to pay for their medications. If not for St. Mary’s, they would have nothing to eat. Imagine children going to school hungry. They can’t concentrate on schoolwork because their stomachs are growling. Boys and girls from low-income families have the most difficult time on Mondays because they have had very little to eat over the weekend. They are tired and have very little energy. But you can make a real difference by taking action today! For every $1 you send, we can distribute enough food for 7 meals. Just think how many neighbors you can help today! Thank you for your continued partnership to fight hunger in our community.